It is no coincidence that car seats remain comfortable and sturdy after driving thousands of kilometres or withstanding extreme temperature contrasts. A diverse group of men and women of all sizes and builds are the team of professional testers that reproduce the action of getting in and out of a car 6 000 times in a week. "Each tester repeats this action 700 times a day to simulate what a car seat endures over a period of five years. 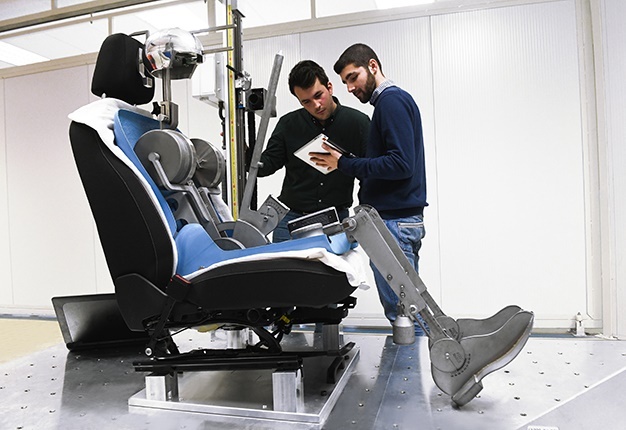 "Some of them wear jeans with rivets and buttons on the back pockets or reinforced seams in order to ensure the resistance of the foam and fabric of the future car seat, which in addition has to adapt to any driver who sits on it," explains Javier García, the engineer in charge of Seat’s car seat testing. Another test consists in reproducing multiple rubbing motions on a car seat. It is carried out in the lab and simulates the weight of a 75kg torso. "For 3 weeks, a machine performs 22 000 friction cycles 24 hours a day, simulating daily movements made by a user weighing more than 100kg," says Javier. Following the test, it is essential to assess the performance of the car seat and verify whether it still looks the same and has the same initial properties. A car shakes intensely inside a booth to simulate driving conditions on uneven surfaces. The test lasts 225 hours on end to reproduce the normal use of a vehicle over a distance of up to 300 000km. The same test is also used to expose the car to temperatures that go from 80C to -35C. "Our work consists in evaluating the vehicle before, during and after the test to ensure that its characteristics haven’t changed and it hasn’t suffered any breakage or damage," adds García. Inside a chamber at -20C, an engineer analyses the performance of a heated seat on a Seat Arona. He uses a thermographic camera to verify that it reaches a comfortable temperature in just 3 minutes, going up to 40C 15 minutes later. The heat map also shows that the heat is evenly spread over the entire surface, which contributes to the comfort of the future driver. is there an ideal sitting position to drive safely and comfortably? The answer is 'Yes, there is'. 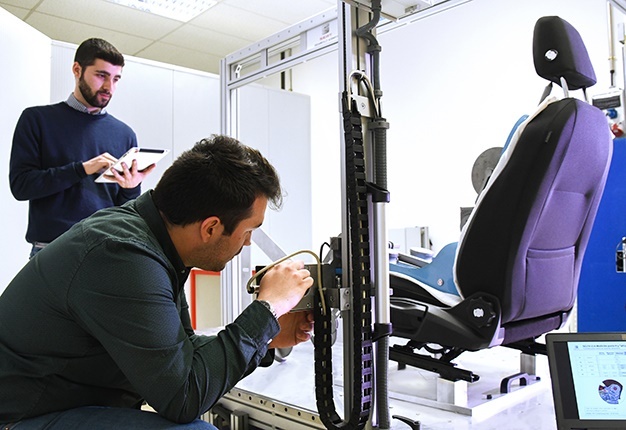 Javier García and his team of engineers measure up to 20 indication points on a car seat to verify the correct placement of the torso, the distance to the headrest or the angle of the driver’s femur. "The most important aspect is the placement of the dummy’s hips, which we measure with a laser, or the positioning of elements such as the headrests, which are essential for the safety of the occupants. With these ergonomic calculations we can guarantee that the driver’s position is comfortable as well as safe," he explains.